Actress Kim Jung Nan left SHINee's fandom for BTS? 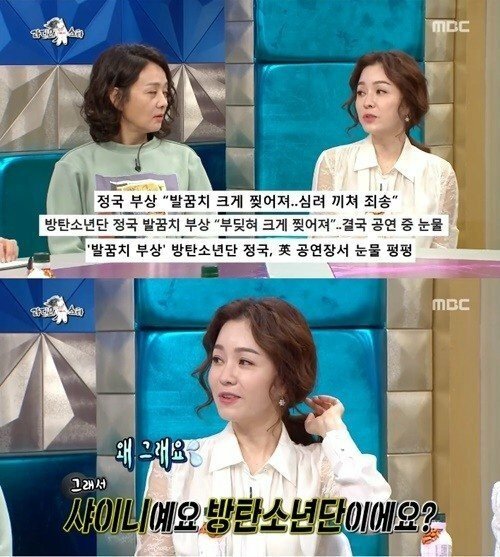 Actress Kim Jung Nan addressed rumors about switching her allegiances from SHINee's fandom to BTS. On the October 31 airing of MBC's 'Radio Star,' the MCs asked if Kim Jung Nam, who's known to be a huge fan of SHINee, transferred over to BTS. Kim Jung Nam waved her hands 'no,' and said, "There's a misunderstanding." MC Yoon Jong Shin continued to ask, "I heard you cried because of BTS?" Kim Jung Nam explained, "Jungkook got injured during the world tour. It was their first show in Europe. He must've wanted to perform so bad. I heard he cried because he was upset and I cried along with him." The MCs continued to poke fun, asking, "So is it SHINee or BTS?" Kim Jung Nam refused to answer, saying, "Why are you doing this?" Fellow guest Jessi also urged her to answer, saying, "If you have to choose between the two then who is it?" Kim Jung Nam ultimately said, "I'm very much into BTS nowadays." I never understood the implication that you can only be part of one fandom, as if people don’t listen to a variety of music.